You are a regular patron of SUMMER BREEZE Open Air and, as such, almost belong to the festival inventory? For you, SUMMER BREEZE means a lot more than spending a fun weekend with good music? You like to save money and don’t look forward to ticket prices inevitably going up? Then CLUB 666 is exactly what you need! CLUB 666 offers all those interested patrons who have shown their loyalty to the festival over the past few years the possibility to enjoy a ticket price freeze for three whole years, besides many other specials! 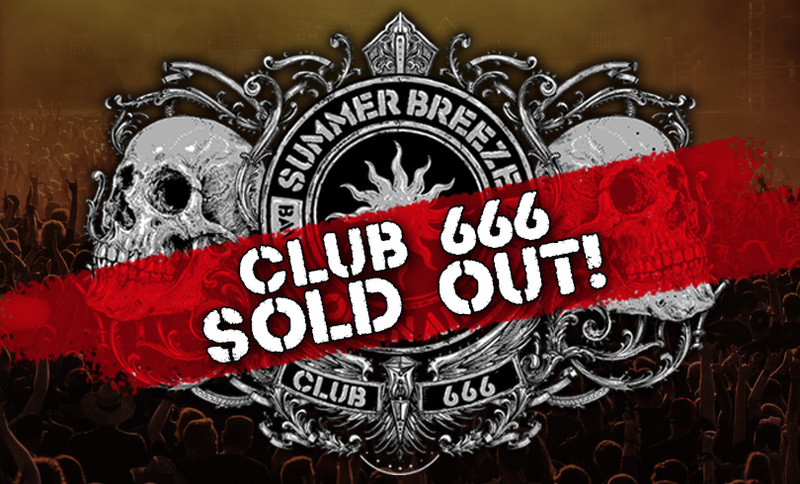 This means, if you become a member of CLUB 666 now, you get a three-year ticket for SUMMER BREEZE 2019, 2020 and 2021 for only 321,- Euro (99,- € + 111,- € + 111,- €, the last chance for a SUMMER BREEZE ticket for the price of 99,-€)! ONE ticket price for the next three years! NO price increase in the next three years! As a club member you get the chance at one SUMMER BREEZE of your choice in the next three years to attend the festival as a VIP guest, without paying anything extra! CLUB 666 members will also get the chance to preorder their desired merchandise for each festival and to collect it without long waiting times. This means: never sold-out limited merchandise items ever again, you have the full choice! Each member will obviously get a personalised member cars, as well as an exclusive CLUB 666 armband. Three-year ticket for SUMMER BREEZE 2019, 2020 and 2021 for only €321.- (99,- € + 111,- € + 111,- €)! 1X VIP guest in the next three years at no extra charge! Preorder and collection of festival merchandise! Minimise your waiting time!